Let’s face it – your toilet takes a lot of ‘crap’ from everyone in your household. The least you can do is keep it clean. The lowly task of ridding your toilet of spills, splatters and stains fall squarely on one humble tool – the toilet brush. As one of the most overlooked items in any home, you can pretty much guarantee that the question, ‘what’s the best brush for cleaning my toilet?’ Never crosses your mind. Unless of course your toilet is dirty or stained. The chart below is a great place to get started comparing different toilet brushes and holders right now! What Makes a Good Toilet Brush? You might be tempted to think that every toilet brush is the same, but that’s not the case. There is a huge variety of toilet brushes on the market. In this article, we look at the best brush for cleaning your toilet. The first question for any good toilet brush is, ‘will it get my yucky toilet clean?’ The primary qualities of a good toilet brush are simple: robust construction, durability and the ability to withstand repeated use without bending or breaking. However, for those who care about appearances, functionality isn’t everything. A good brush will be well-designed and aesthetically pleasing and should blend into your home rather than stand out like a sore thumb. Some people want a toilet brush that won’t clash with their home’s existing decor. At the same time, if it can’t clean your toilet, it doesn’t matter how nice it looks. What Are the Benefits of Having a Good Toilet Brush? Of course, this is an easy answer. Getting your toilet clean each and every time that you scrub it is a hallmark of a good toilet brush. Whether you clean your toilet once a week or once a day, you want to be sure you have a top rated toilet brush for cleaning. Reliability and knowing that it will do the ‘crappiest’ job in your home when you need it to makes it a good toilet brush. What Are Some Common Problems of Bad Toilet Brushes? We’re guessing that you have had a brush or two fall apart on you? Bad toilet brushes are like crappy friends – they say they’ll do something for you, but they let you down in the end. Simply put, a bad toilet brush does not get the job done. If your toilet brush can’t reach the stains and splatters, then it is not doing its job, and your toilet is not at all clean. How Do you Find the Best Brushes Available Today? How much space is there in my bathroom? Where will I store the toilet bowl brush? Do I care how it looks? Which bathroom (or bathrooms) will I use the toilet brush in? Does this toilet brush come with a toilet brush holder or caddy? What Are the Prices of the Best Brushes Today? You can buy a cheaply made toilet brush for less than $10. As with most things, the price is related to the quality. A reasonably priced, quality toilet brush might cost $25 or more. To get a genuinely high-quality toilet brush for cleaning that is well made and durable, plan on paying $35 to $40 or more. If it helps you get rid of toilet and bathroom germs – and does a great job – it’s worth it! What Do Our Product Reviews Have to Say? If you’re the kind of person who appreciates multipurpose tools, this could be the toilet brush for you. Mr. Clean’s Bowl Caddy Set is a combination toilet brush and plunger, both of which are housed in their caddy. The rounded headed brush and the plunger are made from durable plastic with rubber grip handles. Also, this attractive looking space-saving caddy has a non-slip base. With this brush, small is the name of the game. 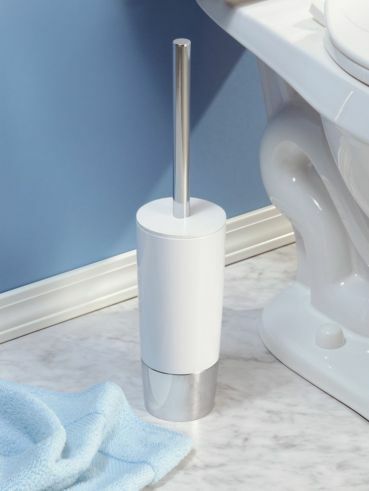 The size of this toilet brush means it will fit in any sized bathroom, even under cabinets if you prefer to keep it out of sight. While it may be short in stature, it is long on performance. Designed with a tapered head, this toilet brush allows you get into tricky spots. The base keeps the brush hidden when not in use. It also has a convenient automatic opening and closing feature. Ventilation slits in the base allow water to evaporate faster, keeping the toilet brush more sanitary. Attractive and durable, this toilet brush is made of stainless steel and ceramic. The virtually unbreakable steel brush has tapered bristles for easy cleaning under the rim of your toilet. The bronze and ceramic base make this brush look more like a piece of your home’s decor than a tool for cleaning your toilet! And if the bristles need replacing, the entire brush head can be removed and replaced with a new, clean head. This toilet brush consists of a metal stand with a plastic holder inside to completely cover the brush. 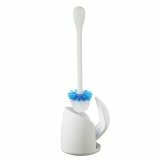 This disguises the brush and helps keep the bathroom cleaner. The actual brush is made of metal with plastic bristles. The small footprint of this toilet brush will allow it to fit in even the smallest space. Like some other models, this toilet brush has a replaceable head. This durable toilet brush is also affordable and is a good buy for those who are on a budget. One of the most well-designed toilet brushes on this list, the crescent head looks cool but also has a purpose. The shape of the head lets you reach your toilet’s nooks and crannies to get rid of the most stubborn stains and splatters. Like several other toilet brushes on this list, the Simple Human brush has a screw off, replaceable head and is completely covered by the base. 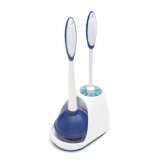 And if the eye-catching design, durability, and effectiveness weren’t enough to make you want this unique toilet brush cleaner, it has another cool feature – a magnetic collar which holds the brush and base together for one-handed, no drip transportation. This basic yet extremely functional toilet bowl brush has a plastic handled brush with chrome accents making it both stylish and unobtrusive. It has a compact holder and a screw off head for easy replacement. This toilet brush may not be as flashy as some of the other ones in this list, but it is ideal for households on a budget or perfect for a seldom-used guest bathroom. This very nice looking, nickel plated steel holder conceals a durable plastic brush. Fully covered to keep germs in, the removable drip cup can be quickly emptied out and cleaned to safeguard your bathroom. The rubberized bottom prevents the base from moving around or tipping over. As stylish as it is functional, this BINO toilet brush would make a welcome addition to any almost bathroom. 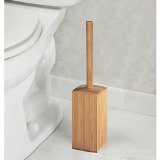 The only bamboo toilet brush on this list, this square holder is a nontraditional way to keep your toilet brush out of sight. Constructed from solid bamboo, this toilet bowl brush for cleaning your toilets will match existing bamboo accessories or blend well with your existing decor. 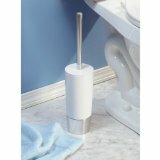 A seemingly very popular new release, this toilet brush and holder is made out of stainless steel. The vents in the holder allow air to escabe and dry – helping to prevent bacteria buildup. People seem to really like the look of the design and the high performance scrubbing brushes. It is priced right as well. Even though cleaning the toilet is a thankless job (you thought we were going to say, crappy), don’t settle for a sub standard toilet brush. If you’re ready to cut through the shall we say, all the soiled markings, check out these toilet brushes and keep your toilet clean and sparkling. Ahh. Very nice indeed. If you’ve found the best brush, maybe it’s time to upgrade your toilet as well? Check out our toilet reviews here.